This evening, the BBC are saying goodbye to Television Centre. On BBC4, I watched Madness play an excellent set in the grounds of the famous studios, while Michael Grade is interviewing some of the BBC’s famous faces on their memories of working there. While all the attention is being focussed on the BBC’s final broadcasts from its legendary home, closer to home another era in television is ending. 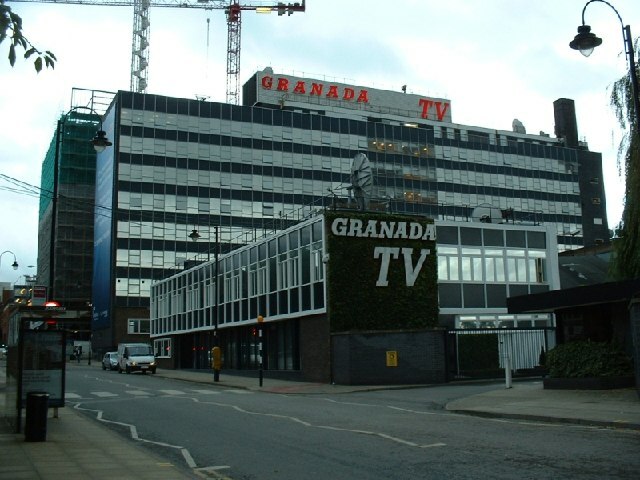 This evening, the final edition of Granada Reports to be broadcast from Granada TV’s equally legendary Quay Street studios was being transmitted. From Monday, it will be broadcast from its new home at Media City. Granada Studios, home to some of the world’s greatest television. Next to the Beeb. I am sad to see Granada leave its Quay Street home. I have walked past it plenty of times over the years. My Mum and my sister both went to watch shows that were recorded at the studios. As a kid, I went on a school trip to the now defunct Granada Studios Tour. I got to walk down Coronation Street and Baker Street (as it was in Granada’s brilliant Sherlock Holmes series), wandered round a room straight out of The Return of the Antelope and watched a debate in the House of Commons. The trip fuelled my interest in television and I hoped to one day be able to walk through the corridors of Granada for real. Alas, it wasn’t to be. My main fear for Granada Studios, is that it will end up being demolished like the BBC on Oxford Road did. I went past the site of the latter on the bus only last week and was sad to see the gaping hole (and the car park) that has been left there. As it isn’t a listed building, there is a big chance that the Quay Street site could also disappear from the Manchester skyline. It would be a total shame if ITV allowed the oldest working studios in Britain, which is probably the best known after Television Centre, to disappear. And I would hate to see it become some other pricey housing development or soulless office block that is constantly empty, even if they call it “Granada Court” or “Bernstein Towers” (after Sir Sidney Bernstein, Granada TV’s founder). As with Television Centre, why can’t they just leave them alone and let them keep making great television? It’s not that I’m opposed to change, but when things seem to be working OK, why change them? Crumbs. I went to Granada Studios several times. Yeah, I know you had the chance to wander down Corrie Street, but it was always Baker Street that grabbed me.